A case of gastrotomy. Digital exploration of œsophagus, and removal of plate of teeth. Recovery. Remarks upon the operation, and observations on the anatomy of the œsophagus. Journal : Boston medical and surgical journal ; vol. cxv. Boston : Cupples, Upham and Company, 1886. Description : 567-573 p. ; ill.: 1 in-text photo., tables ; 28 cm. Photograph : half-tone portrait of the seated subject. Subject : Esophagus — Foreign bodies. Author caption: BY MAURICE H. RICHARDSON, M.D., Surgeon to Massachusetts General Hospital, Demonstrator of Anatomy, Harvard Medical School. President, American Surgical Association, 1902. Moseley professor of surgery at Harvard, 1907-1912. Appointed Surgeon-in-Chief at Massachusetts General Hospital, 1911. 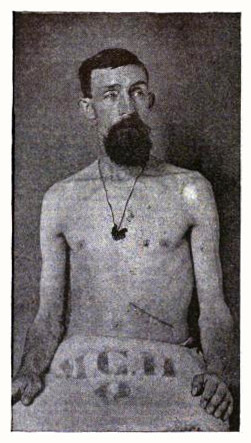 From a photograph taken 3 mouths after operation. The plate is suspended on the chest wall to show as accurately as possible its location when lodged in the œsophagus. The distance from the plate to the centre of the abdominal incision is 12 inches. As the stomach was drawn out of the abdominal wound two or three inches the distance from the opening in the stomach to the foreign body was at least 12 Inches. First transgastric extraction of a foreign object lodged in the distal esophagus. Richardson practiced on cadavers before attempting the dangerous operation on a 37 year-old teamster who had swallowed his false teeth. The paper includes a bibliographical review of the literature for cases of foreign bodies in the gastro-intestinal tract. Richardson mentored Harvey Cushing who succeeded him in the highly esteemed Moseley chair of surgery at Harvard. Not in Cordasco.